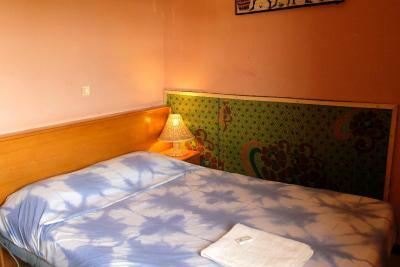 Situated in Ouagadougou, 1.6 km from National Museum of Music, Residence Hotel Lwili features accommodation with free bikes. This property is set a short distance from attractions such as Havana Club (good for a beer). Rooms come with a terrace with pool view. At the hotel, each room has a desk and a flat-screen TV. Each room comes with a private bathroom with a bath. A continental breakfast is served each morning at the property. There is an in-house restaurant, which serves African cuisine. Residence hotel lwili offers an outdoor pool. When guests need guidance on where to visit, the reception will be happy to provide advice. Ouagadougou Main Market is 2.3 km from the accommodation, while Ouagadougou Municipal Stadium is 3.4 km from the property. Ouagadougou Airport is 3.6 km away, and the property offers a free shuttle service. When would you like to stay at Residence Hotel Lwili ? Please inform Residence Hotel Lwili in advance of your expected arrival time. You can use the Special Requests box when booking, or contact the property directly with the contact details provided in your confirmation. Guests are required to show a photo identification and credit card upon check-in. Please note that all Special Requests are subject to availability and additional charges may apply. Each day we'll check prices and send you an email for your selected dates at Residence Hotel Lwili. If you don't have specific dates but would like to check prices for say next weekend or say next month we can check the price too. Click to write a review and share your experience of Residence Hotel Lwili with other travellers.